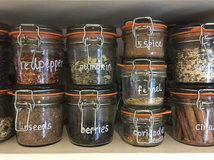 Houzz UK deputy editor. I'm an interiors journalist and editor, previously for the Independent, Guardian and various magazines. 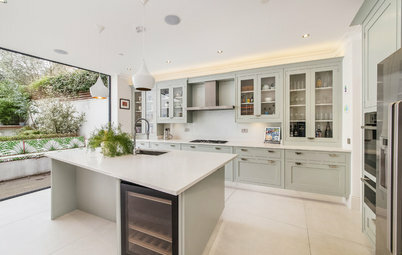 I'm now excited to part of the editorial team at Houzz UK & Ireland, bringing the best of British and Irish design, interiors and architecture to Houzz.com. Deciding to extend is exciting – there’s the promise of all that extra space, and also how much it’ll change the way you and your family live in your home. 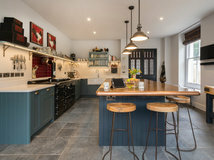 As you’ll already know if you’ve started to look into design ideas, there are many ways to go, but often the chief consideration is how best to make the most of the space. 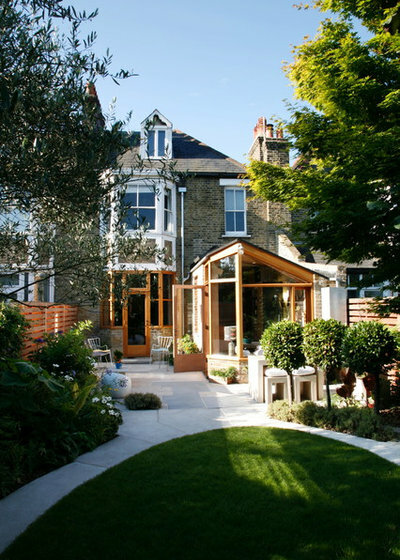 Beyond that, it’s not always obvious how many different aesthetic choices there may be for your particular project and, if you have a period house, you may well be hoping to give your extension as much character as the rest of your home. If so, let these images inspire you. 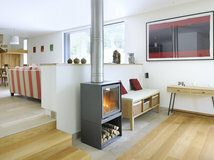 And remember, any photos you like can be saved into an ideabook to show your architect. 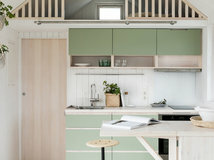 You can even contact the architect behind any of the designs shown here by clicking on the photo to get their details. 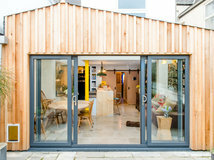 This used to be a conservatory that was “freezing cold in winter and overheated in summer”, according to the designers at Scenario Architecture. It also blocked light from flowing into the living room behind it. It’s only really when you look the other way in this extension (which is on a ground-floor flat in a large Victorian villa) that you get an idea of how unusual it is. 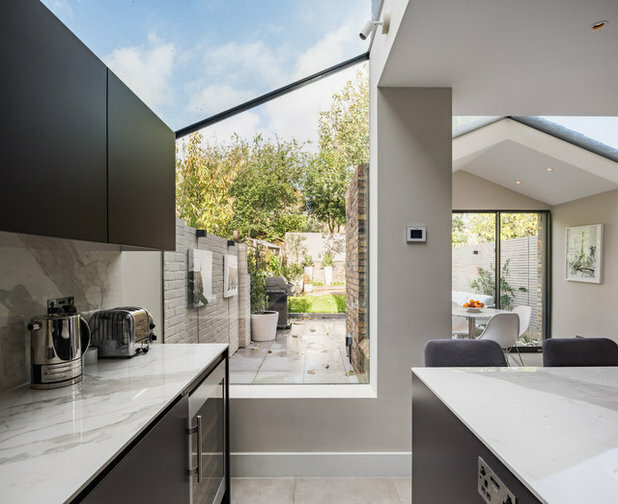 From this angle, what you see is the emphasis on letting in light – thanks to the bonus windows above the bifold doors, the glass roof, a pale colour scheme and that light-reflecting splashback. …look at how cleverly the new part of the house respects the original building. 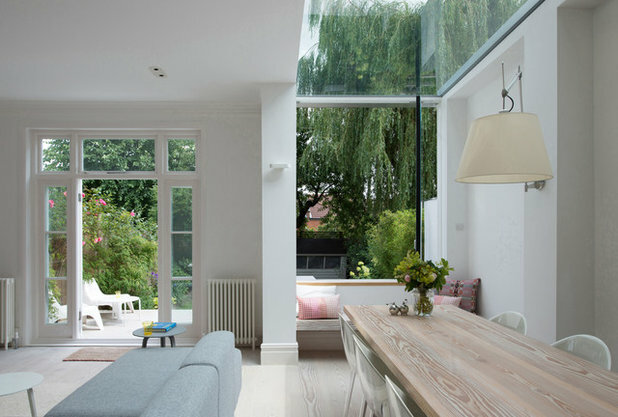 In a conservatory-like approach, the original back wall has become a feature. 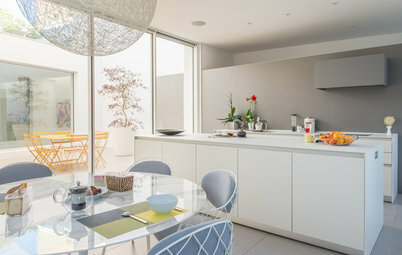 Don’t you just love the Juliet balconies that connect the space to the room behind and let the light flood through? 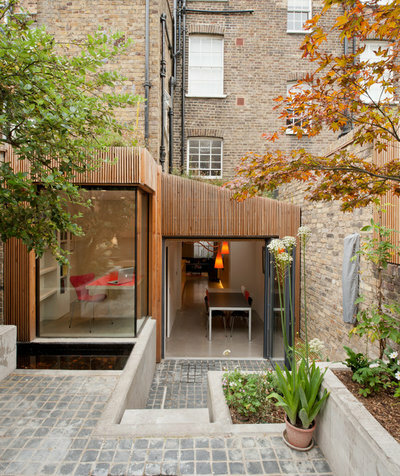 Find an architect to help with your extension on Houzz today. 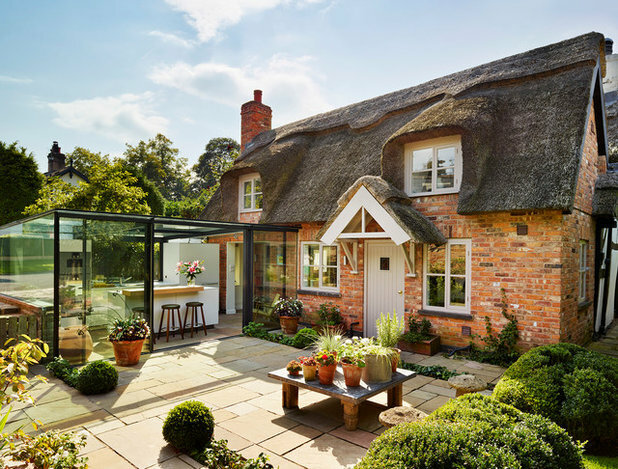 The ‘glass box’ extension on this Grade II listed thatched cottage in Cheshire takes the idea of respecting the original building to a new level. While an ultra-contemporary glazed, angular add-on to such an old, rustic building may not be to everyone’s taste, what’s lovely about this design is the way the original house keeps its integrity. 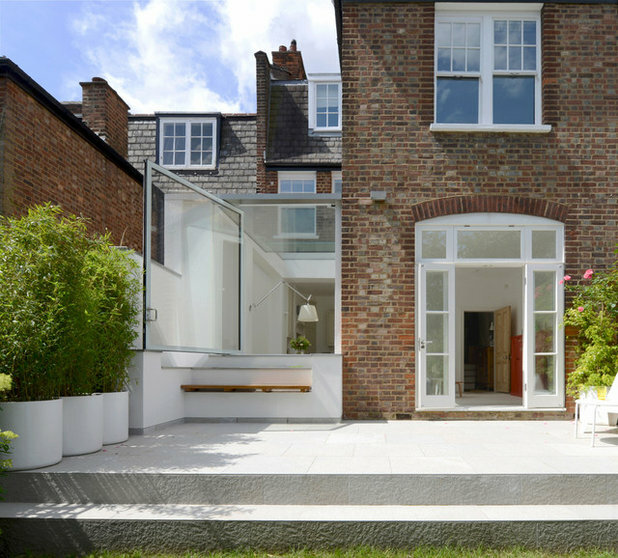 The emphasis on glass and lack of unnecessary bulky framing in the design of the extension means the original front of the house is still very much visible. 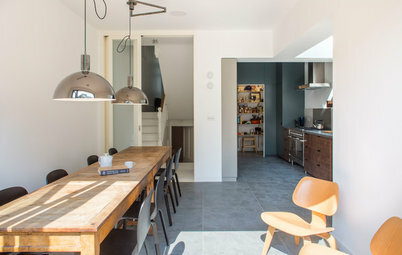 “It doesn’t interfere with the original property too much,” says Alex Saint of bulthaup by Kitchen Architecture, who designed the extension, “and we didn’t have to alter the cottage a great deal to install it.” Structurally, all that needed to be changed was the opening up of the outside wall that leads into the new extension. 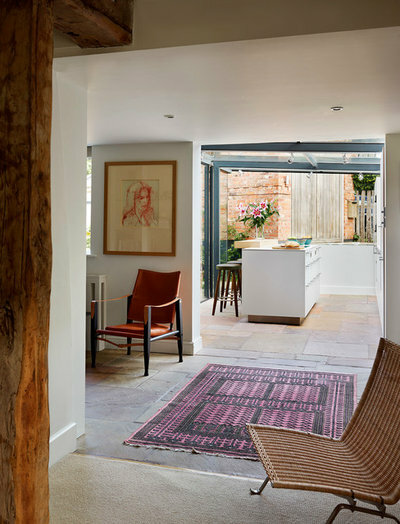 Looking at the extension from inside the original house, you can see how the new and old are further blended by the use of traditional-style flagstone flooring, which bridges the two parts of the building. From this angle, you can also see that the designer has been careful to preserve an almost uninterrupted view of the building beyond, which is built from the same beautiful, warm-coloured bricks as the original house. 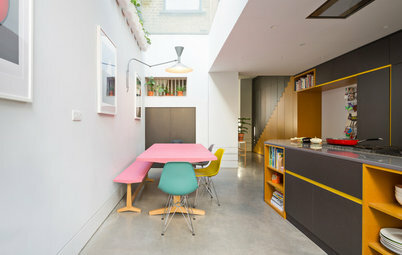 Read all about this extension and see more photos. 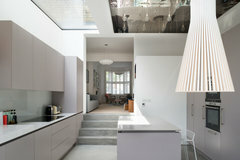 Although this is a defiantly contemporary add-on to a Grade II listed house (in a conservation area made up of late Georgian and early Victorian terraces), it’s a soft and sensitive one. The designers, Fraher Architects, chose sustainable larch wood planks to clad the exterior, which tie in with the colours in the original brickwork. They also planted the double-canted roof with wildflowers, which creates a wonderfully pastoral view out of the home’s original first floor window, seen here. 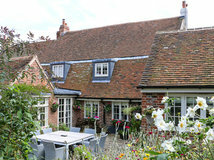 Inside the new ground-floor space, the owners have created a dining area and a peaceful study overlooking the garden. Egon Walesch from Egon Walesch Interiors & Flowers and his partner, Richard, had lived in their 1903-built home for 20 years before deciding to renovate the lean-to at the back of the building. The unique shape of the roof was designed to provide texture and movement to the space, while also referencing the building’s original mouldings. 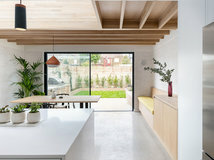 “There’s a lot of plasterwork in this style of house, and we wanted the new ceiling to be a modern gesture towards that,” says Sayarer. 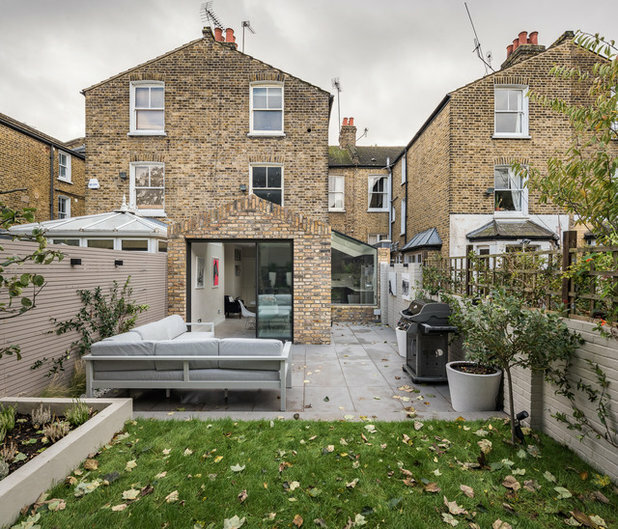 The patio is laid with limestone, while the bricks connecting the extension to the house are reclaimed yellow London stock, designed to blend in with the rest of the building. Read the story of this extension. 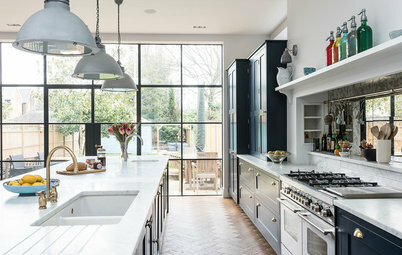 From the inside of this detached 1930s family home in Cambridge, a key feature that stands out is the unusual window formation – a change from the more typical large expanse of uninterrupted glass and bifold doors. This is significant, as it’s a major detail that helps the new part of the house blend in with the original building, as you can see in the next photo. 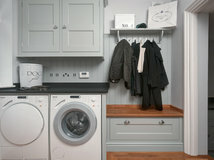 Materials including wood and ceramics were key to the characterful feel of the room. “It’s important to use natural materials that age well wherever possible,” Hawkins adds. 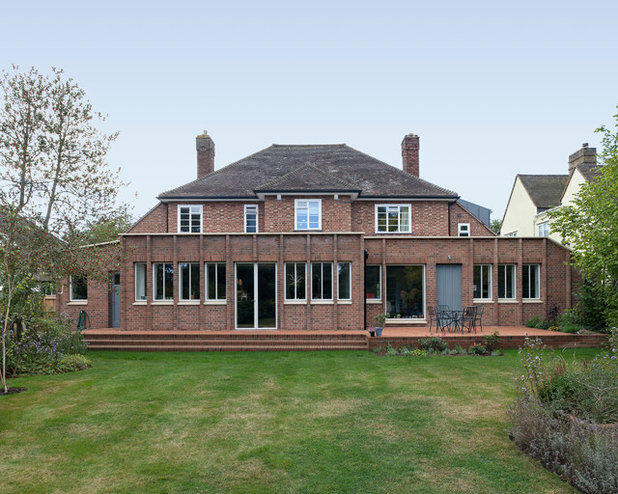 The carefully matched brickwork and the proportions of the windows help to make the new section of the house look as if it were part of the original. Tour the rest of the extension. Choosing brickwork that matches the original so closely makes this extension, designed by FC Architects, almost invisible from the outside. The pitched roof and choice not to extend the full side return also nod to the earlier life of the building. It all makes the large, light-loving patio doors less of a feature in their own right as they, too, blend in more easily with such a backdrop. 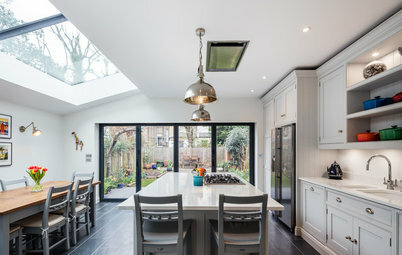 Seen from the inside, however, the extension feels positively futuristic and minimal – giving the owners the best of both worlds. 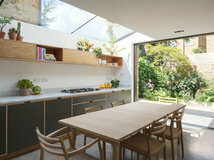 Huge expanses of glass forming much of the ceiling area, as well as an almost seamlessly connected window at the end of the shorter part of the extension, seen here, give the space a lovely link to the garden – making that the feature, rather than the inspired yet non-visually intrusive architecture. 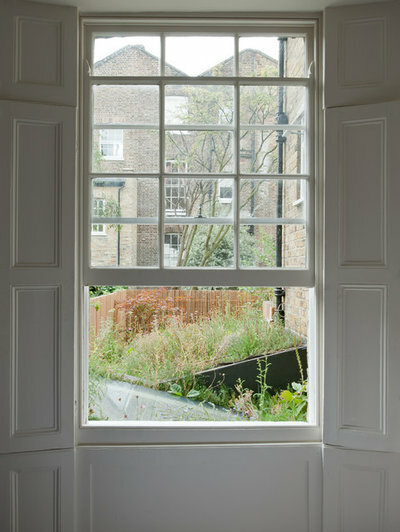 French doors can go a long way to maintaining the ‘old’ feel of a period home. 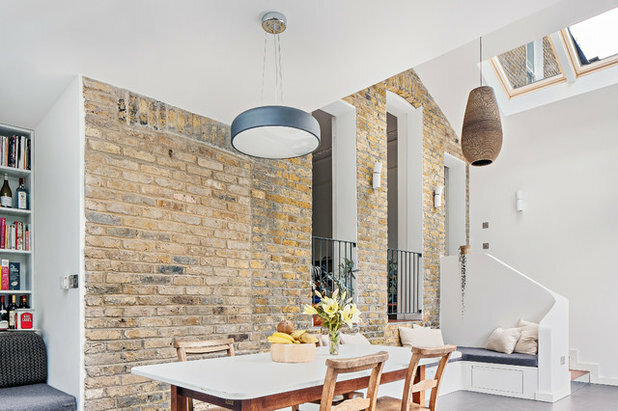 And, as demonstrated in this extension by Paul Archer Design, you don’t have to choose between traditional and contemporary – you can mix the two to great effect. 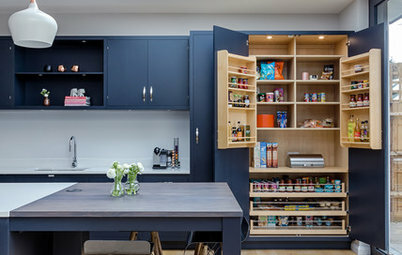 Again, a very open side return extension has been added, providing more space without introducing a dominant visual statement. 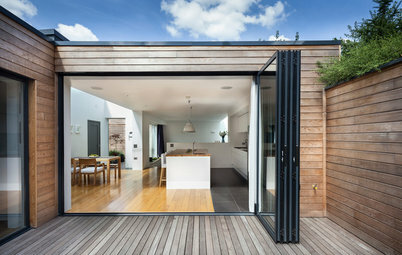 Rather than continue the side return’s expanse of glass across the whole back of the building, with – for example – a strip of bifold doors that would give a very contemporary feel, a huge, single, pivot window has been fitted to this portion only. 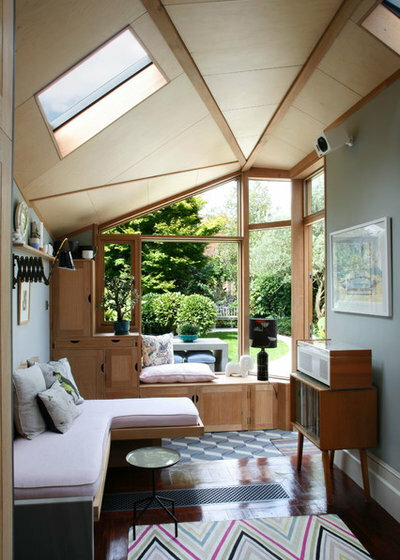 This makes the window seat below it a particularly pleasant place to sit, as anyone relaxing there will feel connected to the garden whether the window is open or closed. The lines of the original building remain in the section of wall that helps to form the window seat, while French doors, which complement the architecture of the existing windows, provide access to the patio. Despite not having a wall-to-wall set of windows, there’s plenty of light, thanks in part to the glass roof over the former side return. Be aware that a feature like this will require regular cleaning to look tip-top. See more photos of this extension. Have you completed an extension? Share the lessons you learned along the way – and any photos – in the Comments section. Some nicely chosen examples. 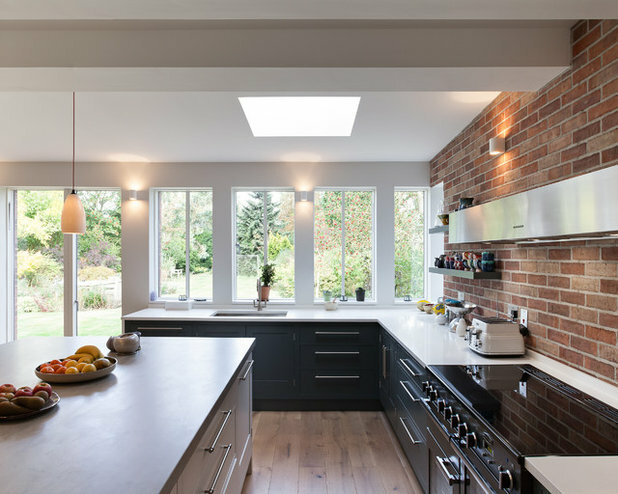 We often find getting the kitchen designed for our client's new home extensions the most satisfying part of the project. 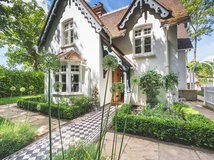 Lovely imagery and architecture in this article! The glass box on the thatched cottage in Cheshire looks 'considered' but I wouldn't want to be in it in the summer months; the temperatures would reach 30 degrees plus and it will be impossible to keep warm in the depths of winter. 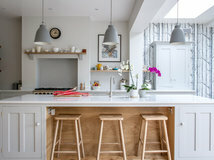 Most Popular Is This The Most Desirable Kitchen Feature Right Now? Most Popular How Can I Make My Loft Conversion Feel Bigger? 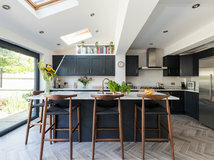 Most Popular Is it Over for Bifold Doors? 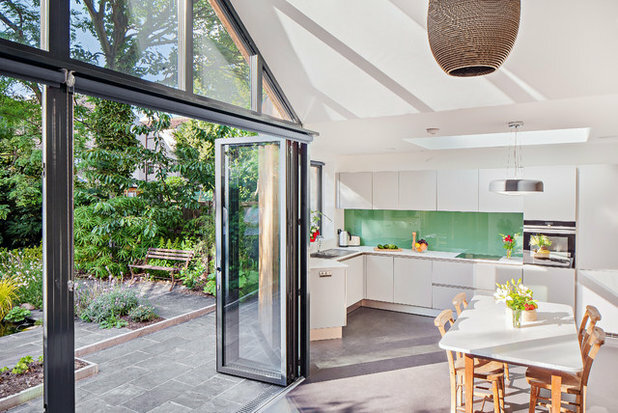 Do bifold doors justify their popularity, or should we be choosing a different way to open up an interior to the garden?